What Does an Early Interventionist Do? 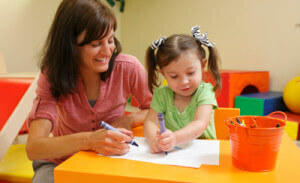 Do you want to learn more about what an early interventionist does? These professionals work with children, typically between birth and age three, who have developmental disabilities or delays. Experts believe that the earlier a child receives services meant to help them reach developmental milestones, the easier it will be for them to overcome these delays. Read on to learn more about the duties, responsibilities, and training of an early childhood interventionist. When a parent notices that a child is not meeting developmental milestones, or a pediatrician or teacher calls this to a parent’s attention, early intervention services may be required. The early interventionist, in conjunction with a team of child development experts, will interview and observe the parent and child at home, in school, and in other relevant settings. He or she will use the information gathered to make a recommendation about the early intervention services the child may benefit from. This recommendation, called an Individualized Family Service Plan, or IFSP, includes information about the child’s developmental, physical and emotional state; family information and recommendations; information about the services the child will receive; where, when, and for how long these services will be provided; how they will be paid for; and the desired outcomes for the child’s development and well-being. Because of the wide range of developmental milestones a child reaches before age three, there are many services that fall under the early intervention umbrella. Some of these include hearing loss support, family counseling, medical services, mental health, nutrition counseling, occupational and/or physical therapy, social work, speech and language services, and vision services. The early interventionist must be intimately familiar with these services to make the best recommendations for his or her clients. A bachelor’s degree and several years of work experience is typically required for this role. Early intervention specialists typically have a degree in psychology, child development, social work, education, special education or a related field. In many cases, a master’s degree in early intervention is required, along with certifications that vary by state. Not only must an early interventionist have an intimate understanding of child development, he or she must have excellent interpersonal skills due to the close work with families, and an ability to navigate the sometimes-challenging web of health and social services. One common career path is a bachelor’s degree in special education followed by a master’s degree in special education with an emphasis or certificate in early intervention. If you’d like to learn more about early intervention, there are federal, state, and non-profit resources that can help. Some of these include The Division for Early Childhood of the Council for Exceptional Children; The Early Childhood Technical Assistance Center; and The National Center for Infants, Toddlers, and Families. In general, what an early interventionist does varies based on the individual child, background, and situation, so he or she must be well versed in all areas of child development.